"Hola, solo queria dejar constancia de mi satisfaccion ante los pedido que..."
Green aventurine chips strands. Each strand measures about 80 cm and contains about 260 chips of green aventurine. 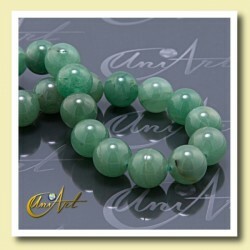 10 mm Green aventurine beads for make jewelry. Green aventurine benefits the fourth chakra and attracts good health, is a variety of green Quartz. Measures approximate each strip of Green aventurine: 40 cm long. Weight 55 Gr. contains 39 balls. Green aventurine beads. Balls 8 mm to produce jewellery and costume jewellery. Green aventurine helps the fourth chakra, bringing balance and health, is a variety of green Quartz. Measures approximate each strip of Green aventurine: 40 cm long. Weight 37 Gr. contains 48 balls. Green Aventurine, 6mm round beads. Green aventurine round beads, measure 6 mm, holed and enfilades into strands, to assemble jewelry such as bracelets and necklaces. Approximate measurements of the strand of green aventurine 6 mm: 40 cm long, weight 20 gr and contains about 62 beads. 4mm round beads of Green Aventurine. They are size 4 mm round beads of green aventurine holed for making necklaces and bracelets. Approximate measures of each strand of green aventurine: 40 cm long. Weight 10 gr. It is containing 95 balls. 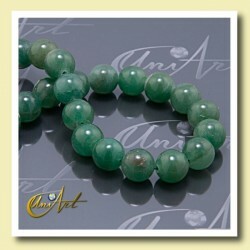 Green aventurine Strips of balls 14 mm for make jewelry. The green aventurine is a kind of green quartz and attracts good health. Measures approximate each strip of Green aventurine: 40 cm long. Weight 100 Gr. contains 28 balls. 10 mm Round beads of Orange Aventurine. String with about 40 cm in length. Each string contains 39 balls and weighs 55 gr. approximately. 8 mm Round beads of Orange Aventurine. String with about 40 cm in length. Each string contains 48 balls and weighs 37 gr. approximately.